Our online family and caregiver groups are perfect for the busy parent or caregiver. You can take your pick between our lunchtime group (12 pm), our evening group (7:30 pm), or participate in both! 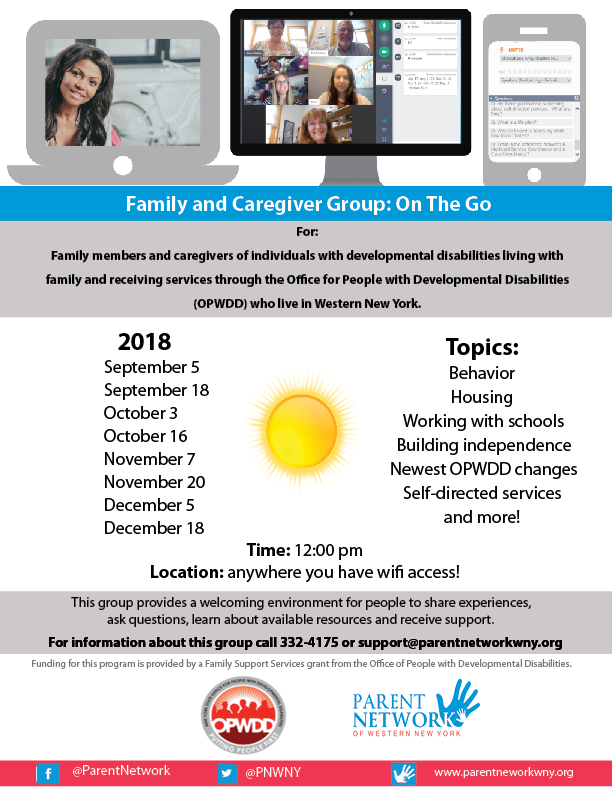 These free family & caregiver groups provide a great pace for parents and other caregivers of young people with developmental disabilities to share experiences, ask questions, learn about available resources and receive support. All of this from anywhere you have wifi access! Some of the topics being addressed will be behavior, working with schools, building independence, housing, newest Office for People With Developmental Disabilities (OPWDD) changes, self-directed services and more. Our online groups are for families and caregivers of people with developmental disabilities living at home approved for OPWDD Services. This group is for people living in the seven counties Western New York (Erie, Niagara, Cattaraugus, Chautauqua, Allegany, Genesee, Orleans). Download the daytime flyer here. Download the nighttime flyer here. Next Parent Network Pod – Welcome!